Diggers Valley: 10 December 2011. The week beginning the 10th of December 2011. 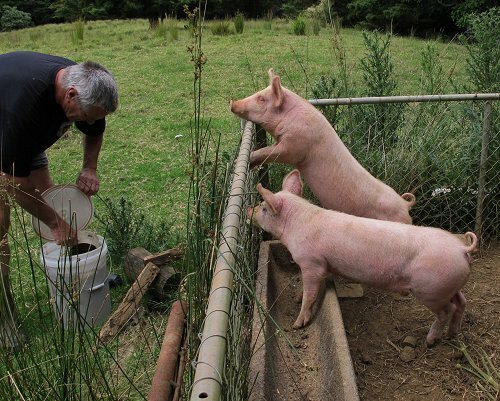 Our friend Ronnie gave Stephan some of her spare cooked pig food, having an ongoing supply of food scraps but not enough pigs to eat it at present. It smelt revolting, but the pigs absolutely loved it! Joe 90, as Stephan has always called him, is a fine-looking fellow. He and Athena have the whole of Flat 2 to themselves at present, so they have lots of feed and shade in which to relax if the weather is warm. I needed to put some cattle into the Bush Flat paddock, so took an electric tape to protect the orchid plants along the Bush Block fenceline. They have all finished flowering, but there would be no point in their season, if they did not set and then release seed. The little bits of pink you may be able to see, are plastic ribbon marking the positions of some of the plants. I spent the day in Whangarei with Jill, visiting the local dementia specialist. Our lives are changing. Having watched the progress (or regress) of a very nice acquaintance, and then my beloved Godmother through Alzheimer's Disease, it looks as though I shall now have the opportunity to learn even more about it. 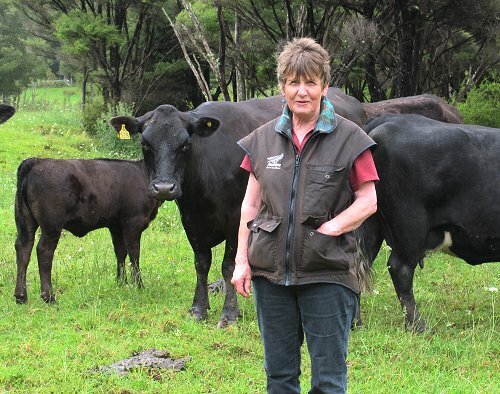 Sue, another Angus breeder, came to visit us and the cows. Sue was one of the Angus women in the first ever weekly page on this site. This picture is taken in the paddock just beyond the gate in the 2001 picture. Sue's English visitor, Emma, came too and made use of our bovine paddock furniture (Demelza). 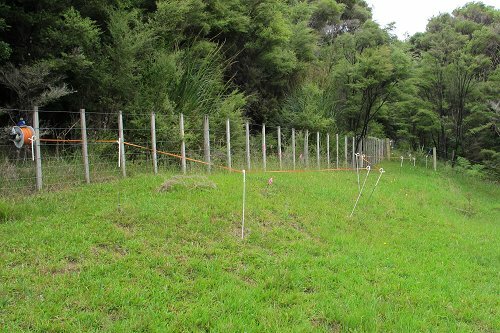 This is a picture of the grass on our newest 1.7 Hectares, over the road where we installed the replacement boundary fence two summers ago. 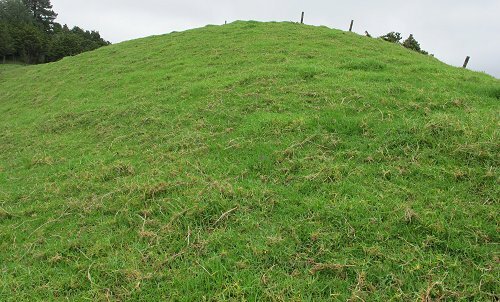 Last year the grass was quite out of control, but the animals have brought it back into a productive state remarkably quickly. 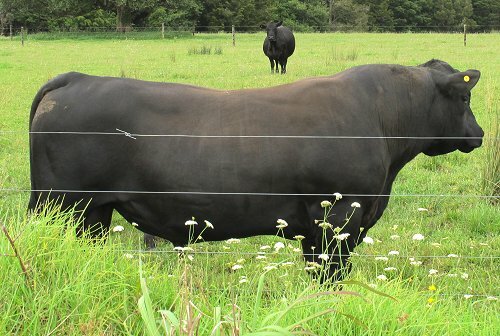 Lots of people hate Kikuyu, but with cows (as opposed to young cattle) it's easy enough to keep it under control. 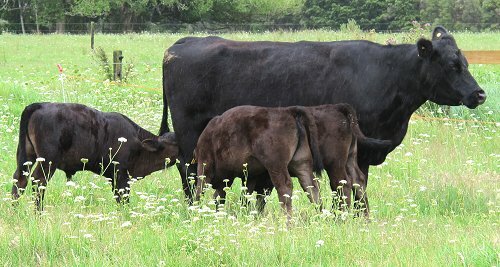 When I put 545 and the twins in with the house cows so they would have better feed, this is not something I anticipated. But since we taught Imagen's son that udders on cows yield milk, he's been trying to get some from any cow other than his mother and 545 is obviously a good prospect because she seems not to be able to count beyond two. I'm sure she knew he was there, but she didn't seem any more than mildly concerned. My concern was much greater because she's in light condition anyway and whatever extra milk she produces on better feed in this paddock, is needed by her daughters. Over 90 mm of rain fell overnight so there was a flood this morning! We never complain about rain at this time of the year. 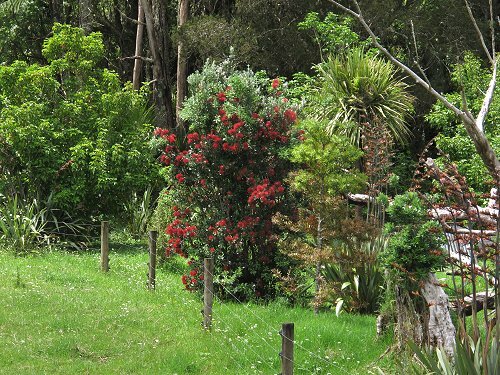 Our Pohutukawa is flowering a little later than those in town and some out on the coast but its colour is better this year than it was last. Watching this native area develop is giving us both a huge amount of pleasure. 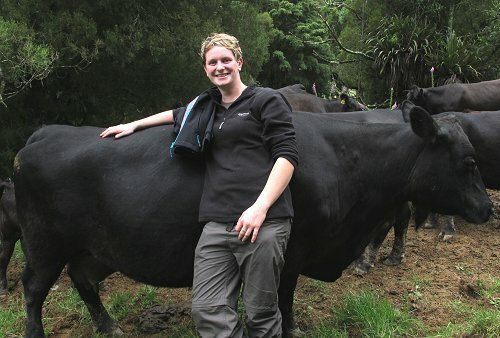 Jill and I went for a walk over the road and up the hill to check on the cows and calves there. 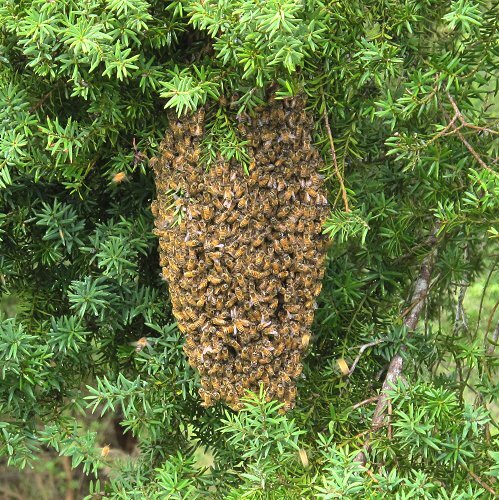 This swarm of bees was hanging in a Totara tree (over a very uneven patch of ground, which would make it very difficult for anyone to come and collect it, if they managed to get here in time). When I went back three days later, the bees were still there! I like this picture because of all the trees in the middle distance. The Herekino Range is behind (where all the orchids presumably come from). There are some Eucalyptus trees in the picture too, belonging to one of the neighbours between us and the Range on that side of the farm. The big Pine plantation behind our farm is just out of the picture to the right. The time appears to have come for Athena. 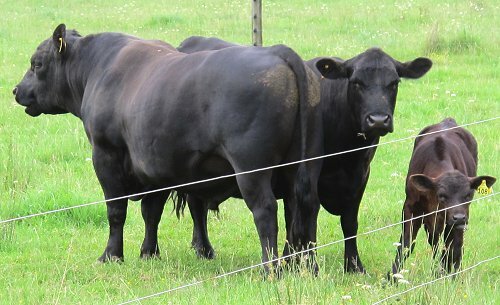 The bull stayed close all day, although I saw no definite sort of activity between them. They must be identical: they even blink at the same time. We've left docking the lambs very late this year, until I wondered if we should still do them. Two things concerned me: firstly that they'd got too big so that the constricting rings would not work adequately or humanely, and secondly that the protection provided to them by the passive immunity gained via colostrum just after birth, would have worn off and they'd be in danger of succumbing to Tetanus as a result of the docking injuries. When I could not get hold of six doses of Lamb Vaccine (which gives immediate anti-Tetanus protection for docking), I bought 5-in-1 instead and we gave them all a shot of it last Saturday. I understand that their immune systems should by now have had a chance to respond to give them enough protection for us to proceed. This afternoon, the wet weather having cleared and the sheep having dried out, we put them up in the yards to check on some twitchiness we thought might indicate fly (and maggot) problems, of which we could find no sign. 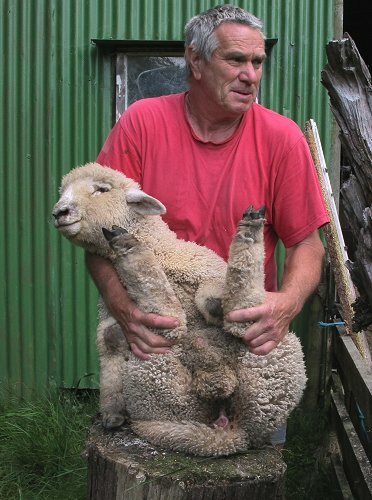 Then Stephan caught and held each lamb and I put rings on tails and scrota. This is a good way to have them firmly held to have easy access to the bits for ringing, and not get kicked in the face in the process. This is Dotty's son. We sent them back to the House paddock so we can keep a close eye on them over the next few days, in case of flies or bad reactions to the docking.